The Egg Gravity (エッググラビティー Eggugurabitī) is the seventh boss of Sonic Advance 3, and is fought in Chaos Angel's boss Act. Like the other seventh zone bosses in the last two Sonic Advance games, this boss has its own theme. 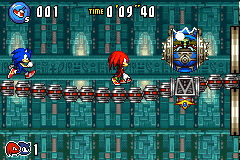 This battle takes place on an elastic "bridge" with Eggman connected to it. Spikes are on both the floor and the ceiling and Eggman himself is protected by electricity. The only weak point this time is Gemerl. At both sides of the arena, there are chutes that will take you to the opposite of the bridge, allowing you to attack Gemerl, as Eggman will flip occasionally. When you attack him, Eggman is launched up up (or down) into the spikes and damaged. After every hit, he will spin wildly, going back and forth in an attempt to hit the player. The more hits taken, the faster he will move. Eggman also "leaps", causing the player to slingshot into the spikes above and below the arena. This also holds true when the player hits Gemerl, as Eggman's momentum will launch them into the spikes if they do not get away quick enough. After you defeat this boss with 8 hits (6 on Easy), you will be sent to Altar Emerald, which is then unlocked in Chaos Angel's Zone Map. Due to the similarity in appearance, this boss is often called the "Egg Snake II" in reference to the boss of Egg Rocket/Cosmic Angel Zone in Sonic Advance. This page was last edited on 16 December 2017, at 12:49.